In 1867, the United States was recovering from the tragedy of Civil War. Abraham Lincoln had been dead two years; soon, Ulysses S. Grant would be elected president. Wisconsin, twenty years old as a state, was becoming the new home for many of the flood of immigrants arriving from Europe, a strong, determined lot of people, yet humbly aware of their dependence on the grace of God. St. John’s was successful in calling it’s own pastor, Rev. C.K. Keller. Earliest records of St. John’s state three infants were baptized on March 10,1867 by Pastor C. K. Keller, who had arrived that day. Rev. Keller was installed March 24, 1867, and the first worship services were held in the home of Widow Kuke in the earliest years. The 21 members present resolved to buy 10 acres of land from Samuel Broadgate at $10 per acre. A church and parsonage were to be built. 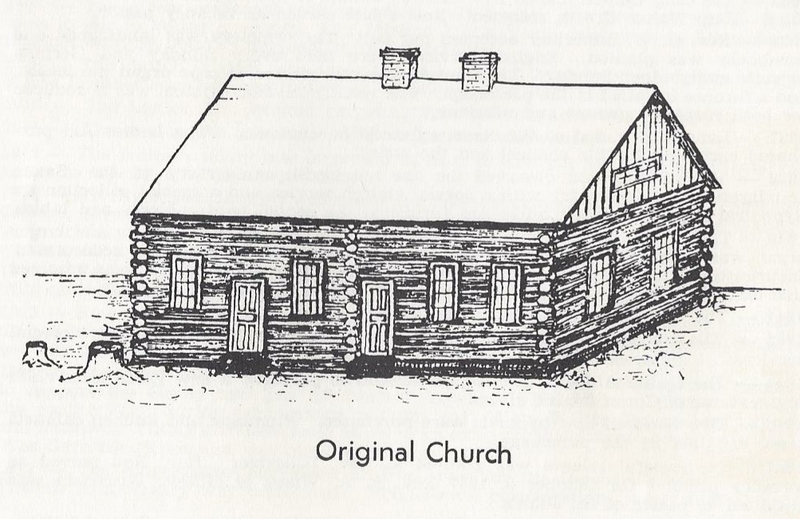 The log structure that was erected served as parsonage, schoolhouse and church. “Where two or three are gathered together in My name, there am I in the midst of them” – the major item of business was to purchase the present land for a place of worship and education and a parsonage. A log building was to be erected. From the early records, we get a picture of life 150 years ago-when the church water pump broke, they decided to use two buckets to draw water out to the well; when the church door proved too narrow for funerals, it was widened; a janitor was hired and each member paid 25 cents toward his ten dollar annual salary There is also evidence of spiritual depth-confirmed youths attending additional instruction up to age sixteen; elders admonishing absent voting members; special rules for conduct and duties of elders. Some of the member experienced great losses in a forest fire in 1871. The nation as a whole suffered financial panic in 1873 and Rev. Keller accepted a call to a congregation near Milwaukee. However, in 1874 under the pastorate of Rev. 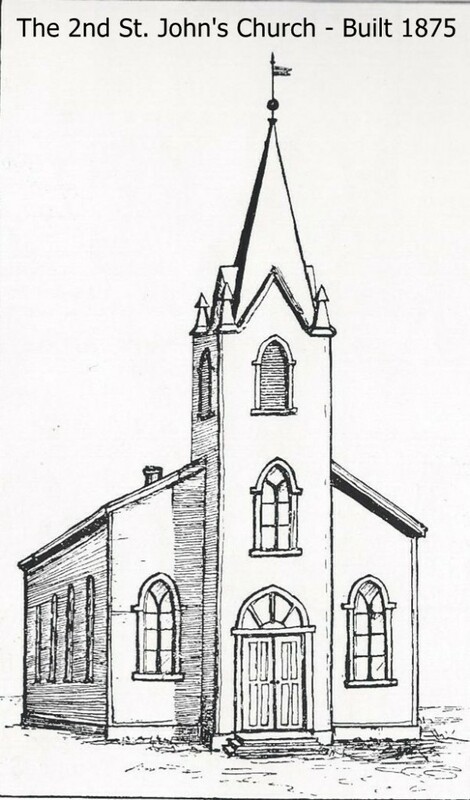 O Zimmermann, who had come in August, 1873, the congregation resolved to build a larger church. It would be fifty by thirty by eighteen feet with a seventy-five foot steeple. Each member was asked to pay $10 and a share of materials, or pay $50. Throughout the early records are requests for gifts to the Lord such as they were able to offer-cords of wood, a new school door, fifty cents per member gifts toward a parsonage study, bushels of grain for the pastor’s horse, six lamps for the church, a day’s time to clean up the property. The church was dedicated to the service of the Lord in the fall of 1875. Pastor Zimmerman preached his farewell sermon April 15, 1880. Rev. 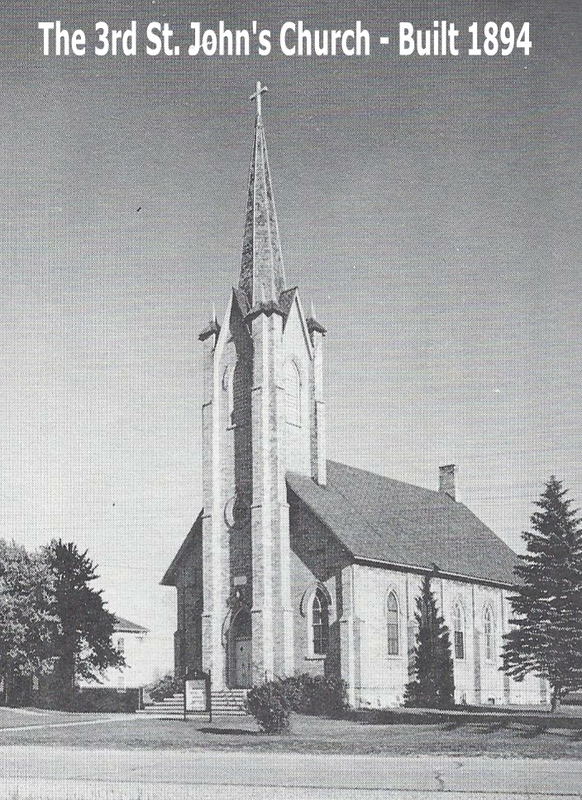 Oehlert of Algoma served St. John’s until the arrival of Rev. F. Steyer, who served from 1880-1884. Members were assessed $6 for Rev. Steyer’s salary, and children of non-members were required to pay $1 per month for school tuition. 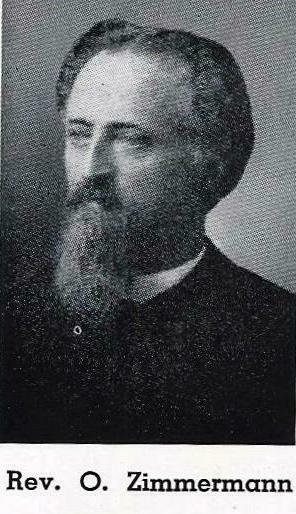 Pastor F. Steyer served from 1880-1884 and was succeeded by Rev. H. Stute in 1885. In 1889, most of the present parsonage was built and members built sheds across the road to shelter their horses during worship. Members were assessed $15 toward the cost of the new parsonage built in 1889. Rev. Stute accepted a call to Augusta in 1890. Rev. Stelter accepted Rankin’s call in 1891 and in 1892 St. John’s celebrated her 25th anniversary of God’s grace in this country place. Rev. 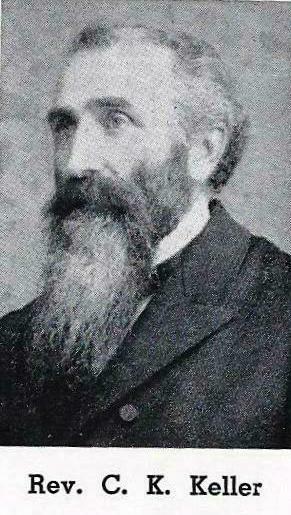 Keller, the first pastor, was speaker. As the seventy-fifth anniversary booklet describes: “the omniscient God deemed it wise to try the faithfulness of this flock in permitting a total destruction of the church edifice and the schoolhouse by fire during the night of November eighteenth and nineteenth in the year 1893.”. The estimated loss was between $2,000 and $3,000. Insurance covered $1,200 of the loss. Having been unaware of their loss, some member arrived the following morning for a Communion service. But what sadness filled their hearts as they found their church and school a heap of glowing embers. It may well be said that the most trying time for St. John’s congregation throughout her existence of seventy-five years. Saddened but not disheartened, the congregation resolved to build an even larger and more beautiful church edifice. The new and larger church began immediately. Many sacrifices were in demand and made by the people. Much labor was donated by the members. Satan, the old evil foe, also sought to thwart the good intentions of the faithful. But God did not permit him to do any real harm. Being on the side of His children, already on the following Ascension Day the cornerstone was laid for the new church. The building of a new sixty by thirty-four by twenty foot church began. The Rev. Diehl of Montpelier preached the sermon for the occasion basing has remarks on Ezra 3:10-11. And on the seventh of October of the same year, the third church was dedicated to the service of the Lord. On October 31, 1894, the church bell was dedicated, and on the fourth of November the new schoolhouse. Minutes of 1895 note that a brass choir was asked to play for worship “Make a joyful noise unto the Lord”.